Lake Washington Girls Middle School’s Outdoor Program is one of the unique ways we offer our students opportunities beyond the classroom. Our outdoor program epitomizes experiential education. L-Dub students get outdoors into Washington’s mountains, deserts, and coastal waters—something LWGMS has promoted since we opened our doors in 1998. While the program has evolved over the years, its core values of experiencing nature, ecological knowledge, personal development, and stewardship remain the same. Adventure and fun are powerful learning tools. small-group interactions in the outdoors contribute to students’ cognitive, physical, social, and emotional growth. Wilderness experiences actively promote, encourage, and develop perspective, compassion, balance, integrity, mindfulness, communication, and responsibility. The outdoor program at LWGMS uses the principles of Leave No Trace in teaching students the skills for enjoying the backcountry and the outdoors. We cover all areas of outdoor education including basic first aid, water safety, cooking, map reading, and navigation so that students develop skills in environmental stewardship, self-confidence, self-sufficiency, community building, and leadership. We backpack, camp, hike, and kayak. Some programs require experience, but most are geared for beginning explorers. We plan developmentally-appropriate and valuable outings that offer manageable risk, natural beauty, and skills with which to engage our natural environment. We offer rigorous financial aid packages for these trips as we believe that every student should have the chance to experience the challenges and the excitement of living in a small group in the outdoors. Ever heard of this weird thing people do where they put everything on their back and hike into the mountains, deserts, or coastlines? Ever been so turned off by the idea that you are actually rather curious as to how people would do such a thing? Or instead, are you really interested in trying it out but never knew how or where to begin? Or maybe, you love car camping but are ready to take your time in the trees to the next level. Well this is your chance! On this trip to Mount Rainier National Park, we will be learning the basics of backpacking! We will learn how to pack a backpack, to cook on backpacking stoves, about the proper ways to camp and dispose of our waste, and the principles of Leave No Trace. We also frolic along the banks of the Carbon River and let the rush of the river lull us to sleep! 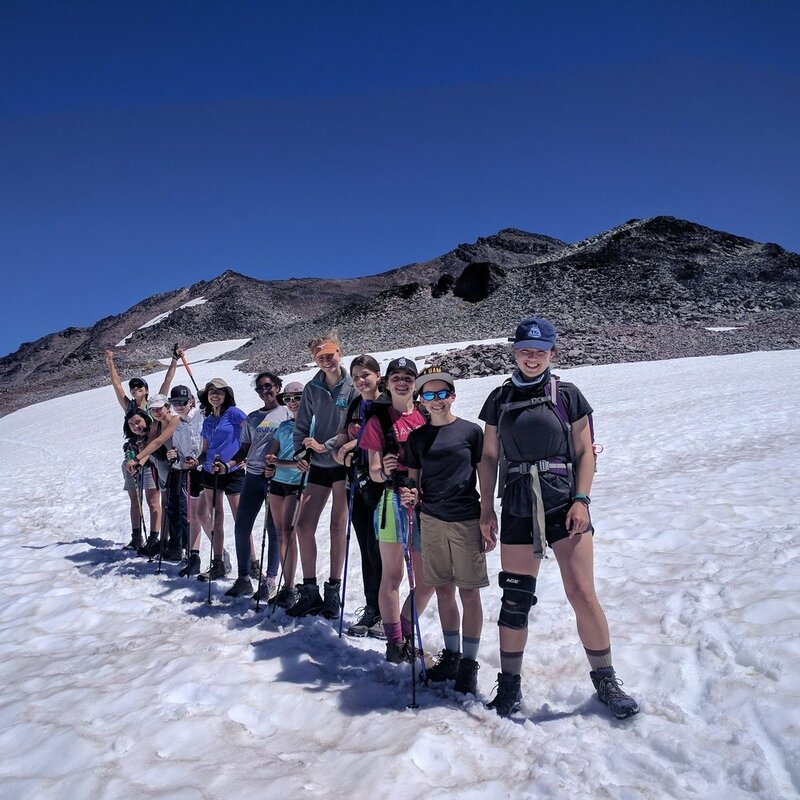 After spending two days at school packing and preparing, you and your group will set off on a three-day backpacking expedition through Mount Rainier National Park. Whether you are looking to hone your skills and learn more tricks, or if you are excited to take your first step into the world of backpacking, all experience levels are welcome! ➡︎ Register for Beginning Backpacking. 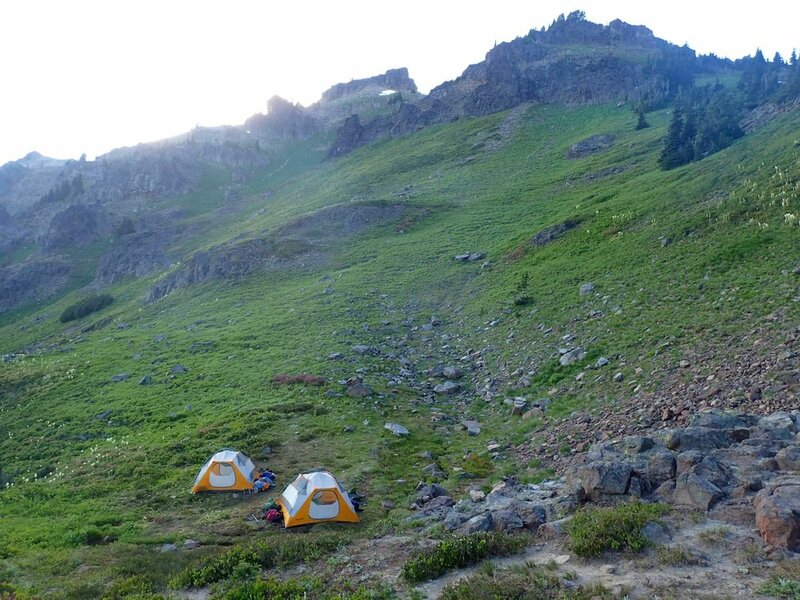 Spend four days backpacking through the Goat Rock Wilderness, arriving at a new campsite each afternoon. Hike about 5 miles a day, carrying everything you need in a backpack weighing 35-45 lbs. This backpacking trip is perfect for all experience levels, including those who are new to backpacking and those who already love backpacking but have only have a week to spare this summer! This challenging and fun adventure will likely be one of your most meaningful and rewarding experiences. ➡︎ Register for Alpine Backpacking. Our backpacking trips range from novice to advanced, and all expeditions expose our students to new environments and new outdoor and leadership skills. 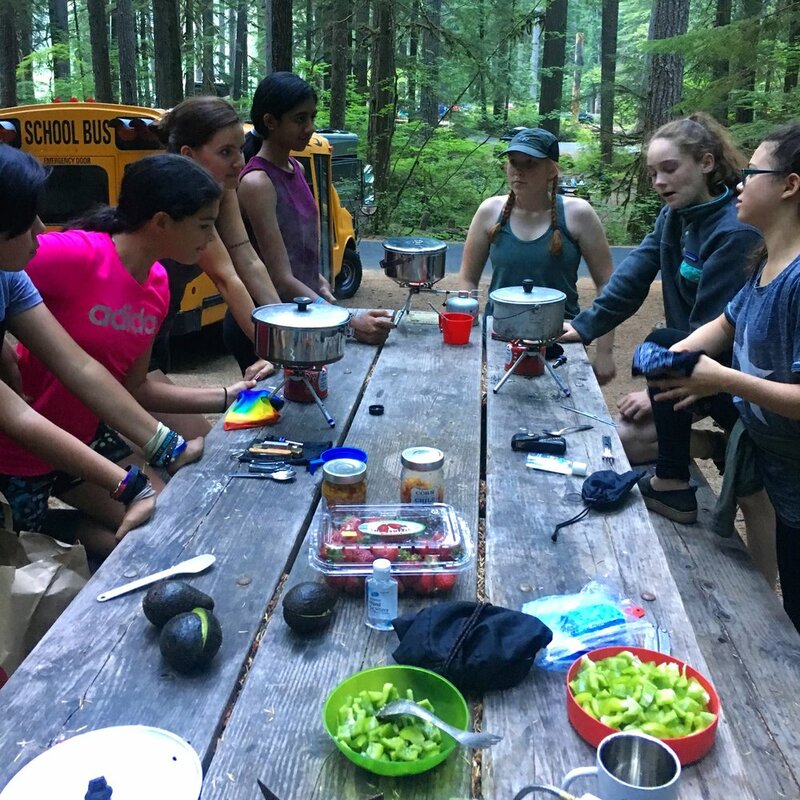 The outdoor program at LWGMS uses the principles of Leave No Trace in teaching girls the skills for enjoying the backcountry and the outdoors. We cover all areas of outdoor education including basic first aid, water safety, cooking, map reading, and navigation in order for our girls to develop skills in environmental stewardship, self-confidence, self-sufficiency, community building, and leadership. ➡︎ Register for Alum Backpacking. Some of the best campsites in the Pacific Northwest are on the San Juan Islands and the only way to get there is by kayak! We’ll head up to the San Juans and meet up with our kayaking guides at Outdoor Odysseys. The group will then set out for a 2-5 hour paddle to one of the nearby islands where we’ll make camp and spend some time relaxing and exploring. We’ll keep our eyes peeled for seals, otters, and porpoises. We’ll feast on the beach before spending each night in our tents under the stars. The following days, we will paddle to campsites on other nearby islands, learning about the San Juan ecosystem and kayaking as we go. We might even embark on a night paddle under the stars! All are welcome. No kayaking experience necessary, but you should be ready for long days on the water in possibly cold (and wet) conditions. ➡︎ Register for Sea Kayaking and Camping. LWGMS Bike Camp is a day camp (with one overnight) for students who want to explore the Puget Sound region by bike. Students will hit local bike trails around the city and beyond, improving their bike handling, map reading, and decision-making skills while learning about new neighborhoods, snacking at our favorite parks, and getting to know each other better. Students can expect to ride for around 5 to 15 miles a day along protected bike trails, such as the Burke Gilman, Alki, and the John Wayne Trail. On the last day, students will bike to a campsite at Iron Horse State Park, learn some of the basics of bike camping, and spend a night by the campfire. ➡︎ Register for Bike Camp. Come learn, explore and play at Lake Washington Girls Middle School this summer! Our summer programs offer children the opportunity to have fun, make new friends, and dive deeper into their interests. What makes Seattle one of the greatest cities in the world? We are lucky enough to be close to mountains, ocean, farmlands, lakes, and a bustling metropolis. This summer experience will provide students with the opportunity to explore some of what makes the Northwest the fabulous place that it is. Together we will visit a range of local sites and participate in a variety of activities to become better acquainted with the rich history and cultural diversity the city has to offer. Participants can expect to take in some art and culture, enjoy some time near the water, hang out with some wildlife, and get outdoors. Seattle is an urban gem full of hidden natural oases, sweeping vistas, historic landmarks, and amazing art installations. Paired with our beautiful weather, there is no better place to be in the summer than the Pacific Northwest. In this camp, students will visit local beaches, parks, and other popular urban outdoor locations. They will learn to navigate the city via bus routes, light rail, and on foot. This is an active, outdoor camp, and will involve walking each day. We are so lucky to live somewhere where the arts can thrive. This summer experience will provide students with the opportunity to take in current exhibitions at local museums each morning, and then return to LWGMS and work on an art project inspired by their visit. We will visit the Seattle Art Museum, the Asian Art Museum, the Olympic Sculpture Park, and more. Participants in this camp will experience a wide variety of media and subject matter.